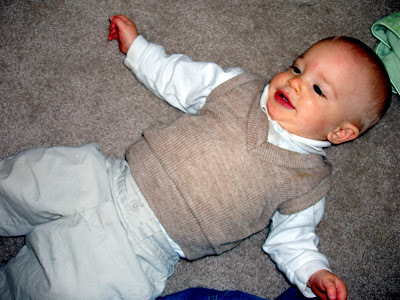 Today Gavin wore a sweater vest that Casey wore when he was this age. 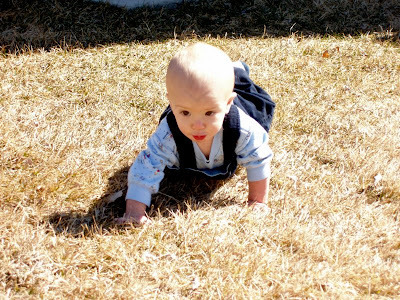 I bet Casey didn't look very different from this cute little guy when he was this age! Gavin loves to climb the stairs, and he can climb them pretty fast! I couldn't get him to stop so that I could get a picture of him. He was just too busy to be bothered! Gavin and Braxton have so much fun when they get together. Here are some cute pictures of them playing together. We had quite the weekend! So, just to warn you, there are a lot of pictures! I was surprised how fun Gavin had doing all the fun Easter activities. On Friday night, we went to Autumn and Dougs and colored eggs. Gavin wanted to get his hands in the mess, and we almost had a couple spills. It was a lot of fun! This is the egg we made fo dad. It says "I love Dad"
On Saturday morning, we went to the Discovery Park in Pleasant Grove for the Easter egg hunt. We got there early, so we went and played at the park for a little bit. They had the eggs all set up in one of the tennis courts. They told parents to stay back by the fence, so I was worried how Gavin would do, but he did pretty good. He crawled out and found one egg and kept throwing it, and then chasing after it. Braxton did awesome and got a lot of eggs! Later that afternoon, we went to Casey's Aunt's house and had lunch and another Easter egg hunt. Gavin is really getting this hunting stuff down. He picks up whatever is colorful in front of him and puts it in his mouth. We got some fun stuff including a balloon, Hot Wheels and lots of candy. He crawled over to Weston and tried to steal his candy. Weston didn't think that was very funny. He woke up to find his Easter basket and loved the eggs that were filled with cereal. He also got a little duck that he loved. 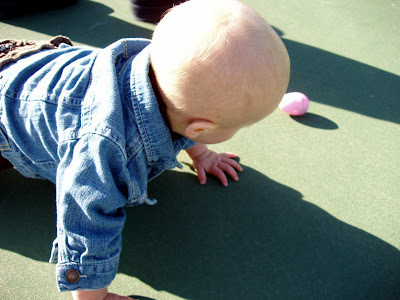 Later that evening, we went to my parent's house for dinner and to have another Easter egg hunt with Damon, Kylie and Braxton. Getting excited to go out and find the eggs! We tried to get a picture with them looking at the camera, but they were too excited with their eggs. Gavin is now 11 months old! This has been a really fun month. He loves to clap and say "yay!". He never claps without saying "yay!". I think "yay" is his first word. He also says "dada" when he is happy, and "momma" when he is sad. I think it is because I give hugs and Casey is the fun one. He LOVES to eat. He could sit all day in his high chair eating and be as happy as can be! His favorite foods right now are: cheerios, bread, peas and carrots (not mashed), spaghetti, chicken, grapes....I could name more. Oh, he is so much fun...one more month and he is the BIG 1! I love this little taste of Spring we have been getting for the past few days! I just hope it keeps coming! 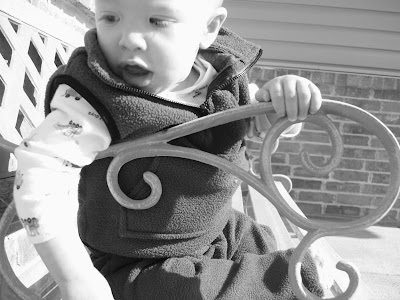 Yesterday Gavin and I spent some time outside, and it was wonderful!! We took the dogs for a walk. Poor little Belle has been getting so FAT sitting inside all day, so she was in need of the exercise, Bear loved it, and Emma enjoyed her ride in the stroller. After our walk, we spent some time in the yard. Gavin loved to pick up the leaves and feel them crinkle in his fingers. We also sat on the hammock for a while and he loved that too. That sun is bright mom! Walking is just around the corner! Gavin can stand all by himself now. He walks really good when I am holding one hand, but he is too chicken to walk on his own...which is okay with me. Take all the time you need Gavin. Here are some videos of Gavin. The first video is Gavin in the tub. Gavin has a fun game he plays in the tub where he puts his face in the water. He thinks it is pretty funny. The second video is him playing "Peek-a-boo" . He loves to play it. He usually will use his hands, but if he has a blanket, he will use the blanket too. It is pretty cute. On Friday night, we babysat Casey's sister's kids, Alivia, Bryce, Whitney and Weston. They are all such good kids, so it was really fun. Alivia and Bryce wanted to play the Wii, Whitney wanted to play with the dogs and Weston just wanted to play with Casey. They brought their dog, Boo, along and Whitney kept saying, "Boo, here is your mom, Belle, here is your dad, Bear and here is your sister, Emma". She thought it was pretty cool that the dogs were all related. Emma and Boo had so much fun playing together.